Once an independent city, the seventeenth-century Dutch-settled borough of Brooklyn is experiencing a twenty-first-century renaissance. Not unlike the tree described by Francie Nolan, the protagonist in the popular book and film A Tree Grows in Brooklyn, this chameleon-like borough and its diverse population of residents derive strength from struggles. The highs and lows of the last nearly four hundred years illustrate the tenacity of a place, its people and, combined, that Brooklyn state of mind. With a meager population of 2,150 in 1731, Breuckelen got its start as one of six parishes chartered by the Dutch West India Company in New Netherland. From its British conquering thirty years later to its reorganization from parishes into Kings County with six municipalities, the settlement was the location of the first major battle of the American Revolutionary War. British occupied until the Treaty of Paris in 1783, after which the Brits began evacuating, Kings County experienced a subsequent surge in urbanization and industrialization, making it both a formidable seaport and a manufacturing center. The onset of the American Civil War saw an inkling of Brooklyn’s independent spirit when the Fourteenth Regiment New York State Militia—the Fourteenth Brooklyn, the only regiment named for its city—was called to service by Lincoln himself. The Red-Legged Devils, as they were called, were so nicknamed for the red French-inspired trousers they wore. “Hold on, boys! Here come those red-legged devils again!” is what Confederate General Thomas J. “Stonewall” Jackson shouted to his soldiers about the relentless charges by the Fourteenth Brooklyn on Henry House Hill in Virginia near Bull Run. Brooklyn maintained its independence and, as a port city and manufacturing hub, witnessed tremendous economic growth in the post–Civil War nineteenth century. Its population had tripled by 1900. Sugar refining and shipbuilding sustained the local economy. With the completion of the Brooklyn Bridge in 1883, access to Manhattan—theretofore only possible by boat—ceased to be an issue. Despite its residents’ major opposition, Brooklyn was consolidated in 1898 into the city of New York. The completion of the Williamsburg Bridge in 1903, the construction of the first subway between Manhattan and Brooklyn, and the subsequent building of the Manhattan Bridge all strengthened ties to Manhattan. For the next fifty years, including during World War II when the Brooklyn Navy Yard played a pivotal role in the construction and repair of battleships and aircraft carriers, Brooklyn exploded. The population reached a high of 2.7 million residents in 1950 as immigrants and the working and middle classes found refuge in its diverse neighborhoods. Sports were the pride of the borough, and the Brooklyn Bridegrooms-turned-Dodgers were the most celebrated of its teams. Those were the borough’s glory years. Look at that tree growing up there out of that grating. It gets no sun, and water only when it rains. It’s growing out of sour earth. And it’s strong because its hard struggle to live is making it strong. Hymowitz attributes the borough’s avoidance of Detroit-level disaster to Giuliani- and Bloomberg-era policing reform in high-crime Brooklyn neighborhoods; rezoning for the coexistence of residential, commercial, and light industry; and the influx of a new generation of “gentrifiers.” Instead of random artistic and creative pioneers who made their way to Brooklyn Heights in the 1980s and 1990s, neighborhoods such as Williamsburg, Bedford-Stuyvesant, Fort Greene, and Bushwick to the north of Atlantic Avenue, and Cobble Hill, Carroll Gardens, Boerum Hill, Park Slope, Prospect Heights, and now Crown Heights to the south of Atlantic Avenue were encroached on and then flooded with college-educated, entrepreneurial, and tech-savvy writers, artists, architects, film and television producers, actors, and other professionals. A new era was upon the BK. Today’s vibe is hipster-business, and the brownstone-speckled, tree-lined streets of its neighborhoods are dotted with Zagat-rated restaurants, prenatal yoga classes, non-Starbuck’s cafés, craft breweries, and an overall sense of community. 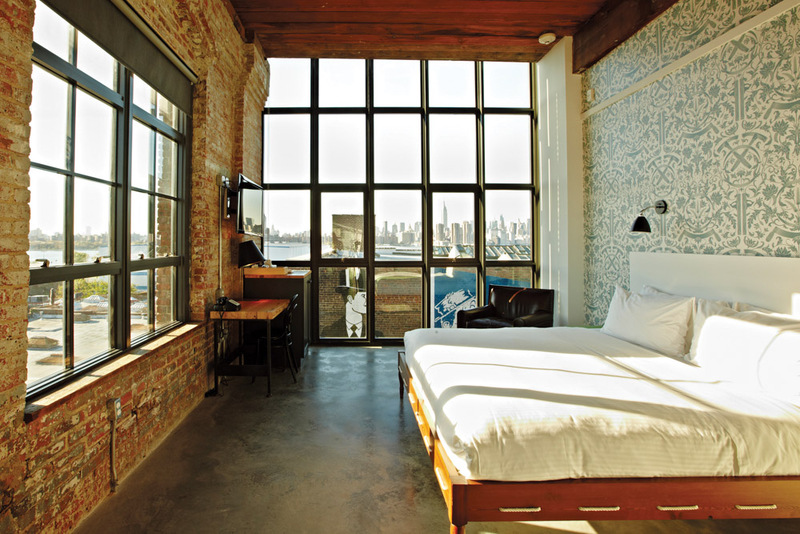 There’s no better way to start a Brooklyn adventure than a few nights at the seventy-room Wythe Hotel in trendy Williamsburg. 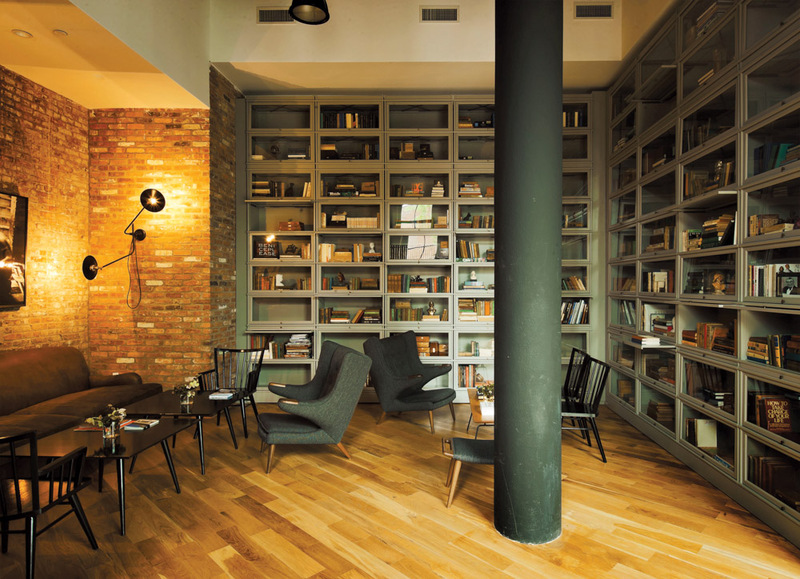 The fully renovated former cooperage, built in 1901, has a boutique feel and historic charm. Many of its rooms have sweeping floor-to-ceiling views of Manhattan, and a couple of its king-sized rooms adjoin to bunk rooms, making it ideal for family stays. One stop on the M train from Manhattan’s Union Square, the riverfront hotel’s most breathtaking views are from the Ides, its sixth-floor rooftop bar and terrace. The hotel’s main-floor restaurant is Reynard, where the executive chef at Seaside’s Pizza Bar, Phil McDonald, spent much of last year as sous chef. Reynard was the brainchild of “nouveau gentrifier” Andrew Tarlow, who established the restaurant Diner (American fare in a converted dining car). Diner was a transformative game changer for Williamsburg in 1998, a time when it was better known as a place to score some drugs. Tarlow now has a virtual empire of popular dining establishments and hoppin’ bars, including the Ides, Marlow & Sons, Marlow & Daughters, Achilles Heel, She Wolf Bakery, and Roman’s. For a more authentic life-in-Brooklyn experience, arrange a stay through Airbnb, which offers economical rentals that include everything from a room in a shared apartment to a full brownstone rental. Airbnb offers a great alternative to the major and minor hotel chains located in downtown Brooklyn. 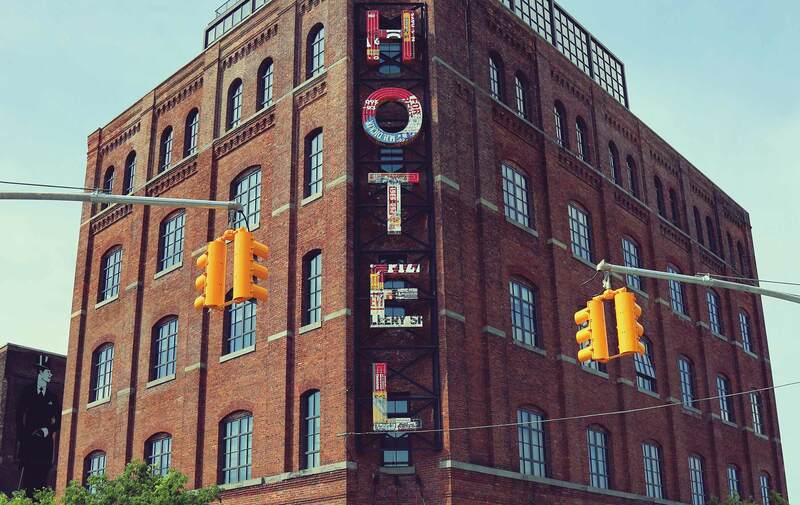 There’s no better way to start a Brooklyn adventure than a few nights at the seventy-room Wythe Hotel in trendy Williamsburg. After arriving by taxi or the many subway lines that pass through Brooklyn, settle in and make your way to view the sunset over Manhattan with a cocktail at the Ides. After dinner at Reynard, amble over to Brooklyn Bowl. This multitasked warehouse space ain’t your mama’s bowling alley; it has sixteen bowling lanes next to its own concert hall, where you can see a rising musical star perform or dance the night away to the late-night tunes of the top DJs who spin there. Come morning, download and open your Uber application or rent a Citi Bike and punch in a destination: 448 Lafayette Avenue in Bedford-Stuyvesant. There you’ll find Dough, where you can dive into such exotically flavored artisanal doughnuts as Passion Fruit, a sweet-tart glaze made with fresh passion fruit puree and sprinkled with cocoa nibs, or café au lait, which is a topping of fresh roasted coffee beans and pecan brown sugar over Dough’s signature glaze. Walk off the doughnut yumminess with a stroll through Clinton Hill, and check out the Rubelle and Norman Schafler Gallery at Pratt Institute, which shows the work of this leading design school’s faculty, students, and alumni. From Pratt, head south to one of the most exciting and fun market-bazaars in the world: Brooklyn Flea’s Winter Flea + Holiday Market (Saturdays and Sundays, 10:00 a.m. to 6:00 p.m.). You’re certain to find unique vintage clothing, furniture, antiques, collectibles, and crafts among the hundred or so vendors, all curated by Brooklyn Flea founders Jonathan Butler and Eric Demby. If you get hungry while you’re shopping, don’t worry—there are some thirty food vendors at Brooklyn Flea too. A block away, created by the same duo, is Berg’n, a Brooklyn beer hall, which features an enormous variety of draft beers and food from Asia Dog, Mighty Quinn’s BBQ, Pizza Moto, and Ramen Burger. A bit farther south of Brooklyn Flea and Berg’n are a world-class museum, a botanic garden, and a zoo. The Brooklyn Museum stays open until 10:00 p.m. on Thursdays and until 11:00 p.m. on the first Saturday of the month. Among its several special exhibits and its permanent collection, the museum is currently exhibiting Killer Heels: The Art of the High-Heeled Shoe through February 15. Basquiat: The Unknown Notebooks, rarely seen notebook pages of sketches, personal observations, poetry fragments, and word play of Brooklyn-born artist Jean-Michel Basquiat, will launch on April 3 and be on display through August 23. Winter, spring, summer, or fall, the Brooklyn Botanic Garden is alive with activity, and its varied outdoor gardens, conservatory gardens, and research collections are always on view. The Prospect Park Zoo is open 365 days a year and, whether you are an adult or a child, there’s nothing quite like seeing a red panda, a dart-poison frog, or any of the other 125 species the zoo houses. Bed-Stuy’s Saraghina restaurant is exactly where you want to land for that special end-of-adventure dinner. At that moment when you sit down at one of its long family-style tables and dine on the simple Italian fare, it’s impossible not to breathe a sigh of “feels like home.” Zagat gives Saraghina a twenty-five rating, which tells you all you need to know about the rising popularity of such neighborhoods as Bed-Stuy and Crown Heights. The restaurant serves breakfast, lunch, and dinner. It is a cash-only establishment. To get a feel for brownstone life in the past and the present, take a walk through historic Stuyvesant Heights, a section of the Bedford-Stuyvesant neighborhood that is a real throwback to a former life. In particular, walk along Stuyvesant and Lewis Avenues and MacDonough and Chauncey Streets. To get a Brooklyn-style Southern fix, stop in at the centrally located Stuyvesant Heights restaurant called Peaches, where you’ll find grits, blackened catfish, collard greens, corn bread, and lots of other comfort foods. 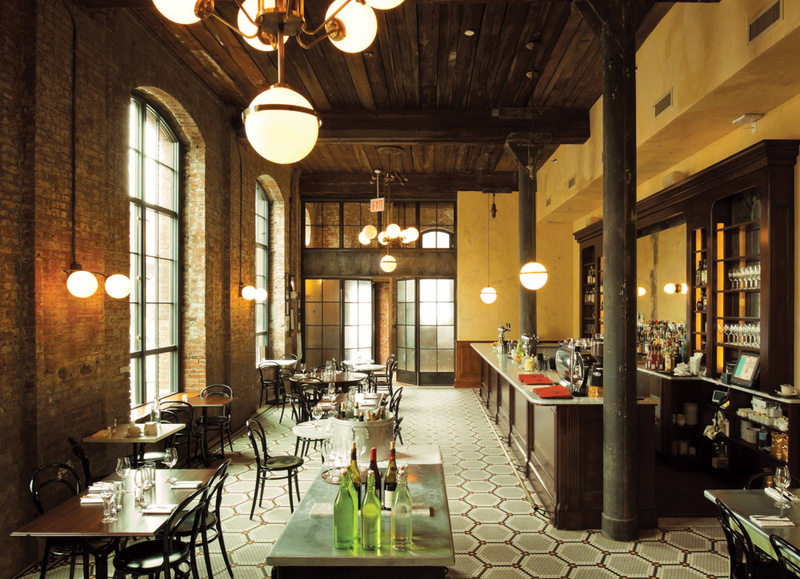 Owners Ben Grossman and Craig Samuel formed B+C Restaurants in 2006 with the establishment of the Smoke Joint in Fort Greene, which was followed by Peaches, the Hothouse, Little Brother BBQ, and Marietta. The Pig Bar is the Smoke Joint’s next-door bourbon and beer dive bar. Other noteworthy stops on a Brooklyn tour include the Museum of Contemporary African Diasporan Arts (MoCADA) and the Brooklyn Academy of Music (BAM), a multifaceted arts center with world-renowned programming in music, dance, film, opera, comedy, theater, visual arts, and literature. If you are traveling with children, stop at the Brooklyn Children’s Museum or the 526-acre Prospect Park. For a little late-night adult playtime, check out the schedule at the Knitting Factory, a music venue and concert house where you might hear anything from aboriginal rock to classic jazz, or catch a performance of an up-and-coming comedian. At the SHoP Architects–designed Barclays Center, sports fans can take in a Brooklyn Nets game—keep an eye out for fans Beyoncé and Jay Z—or attend a headliner concert or the Ringling Bros. and Barnum & Bailey Circus. For the shopper, step into Owl and Thistle General Store, an old-fashioned concept in Crown Heights with a new twist: the owners believe in offering unique local, sustainable, and fair trade goods at reasonable prices. If you’re still looking to shop, the “best shopping hood in America,” according to GQ magazine, is in Williamsburg, from the exit of the Bedford Avenue subway station south along Bedford Avenue and snaking over to the riverfront and back again to Broadway. Along those streets, you’ll find surf shops, perfumeries, urban lumberjack outfitters, vinyl record stores, bespoke tailors, art galleries, and cafés with great coffee. A Manhattan transplant to 30A, Melanie Cissone lived for thirty years and raised her family of five children in New York City. With the exception of one visit to Brooklyn Heights in the 1980s, treks to other boroughs were virtually nonexistent. The relocation of three of her children to Brooklyn has changed all that; these days she finds herself frequenting such formerly “forbidden” neighborhoods as Williamsburg, Bedford-Stuyvesant, and Crown Heights.